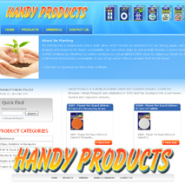 The Handy Products website has a fresh vibrant and yet simple design concept. The website is easy to navigate around and the website visitors users can browse the Handy Products website easily in the product catalog section which has groupings / categories of products such as anti slip tape, double sided foam tape, hook and loop tape, permanent hooks, removable hooks, bumpers and other household, bathroom and kitchen fittings and accessories. Handy Products is an Australian wholesale company with market based in Australia supplying handy products to Australian companies ranging from big department stores to local handy shops. Handy Products supplies huge range of handy products such as anti slip tape, adhesive tapes, double sided foam tape, reflective safety tapes, hook and loop tape, plastic clips, wool felt, velcro strap, permanent hooks, removable hooks and other sorts of handy household products.